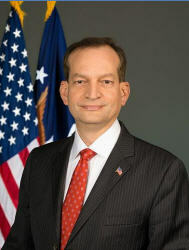 Two Congressmen have written Department of Labor (DOL) Secretary Alex Acosta asking his agency to clarify a binding definition of joint employer, which the National Labor Relations Board (NLRB) is also toiling over via the final rule route. But Secretary Acosta is no fan of the regulatory process, believing Congress should be responsible in these matters. Reps. Bradley Byrne (R.-Ala.) and Henry Cuellar (D.-Texas), a “Blue Dog” Democrat who sometimes sides with the GOP, are behind the Aug. 14 inquiry. They’re not alone. Several business and labor advocacy groups are also pressing for clarity. As a result, several McDonald’s franchise employees took up a class action lawsuit against McDonald’s Corp. when they were fired for demonstrating for a $15 minimum wage. McDonald’s tried to settle with them earlier this year, while including language that it was not doing so as a joint employer, but an administrative law judge rejected the settlements. The case is ongoing and could return to the courtroom, though it is expected that the NLRB — in Republican hands — will overrule the judge.